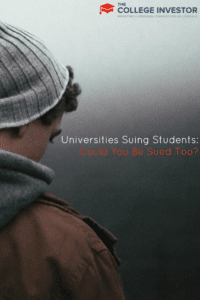 Home » Universities Suing Students: Could You Be Sued Too? I recently stumbled across this article about a growing phenomenon in the United States: colleges and universities are suing former students to get paid back on the student loan debt they took out. The article details the actions of Yale, University of Pennsylvania, and George Washington University and their recent increase in student loan litigation. Universities are being forced to litigate against their student loan borrowers as borrower default rates continue to rise. The recent financial crisis has created a perfect storm for student loan default, and universities are being forced to take action to protect their own financial interests. Schools are targeting Federal Perkins Loan recipients, because these are campus-based loans and schools are responsible for the repayment of these funds. Schools cannot litigate on Federal Stafford Loans because these loans are repaid directly to the U.S. Department of Education (or a third-party designated servicer). Perkins Loans are an especially important class of loans because they are only given out to students who qualify for need-based financial aid through the FAFSA. The “pot of money” that schools have to lend out under the Perkins Loan program is a revolving fund. So, if schools are unable to collect on their extended loans, they will have less funds to lend out to new student borrowers. Because schools have been unable to collect on Perkins Loans, their revolving funds have been diminishing, and they have been forced to litigate to collect these funds. First, this is important because higher education has always been hesitant to enter the arena of litigation. Sure, colleges and universities use collection agencies on a regular basis, but many have chosen to avoid litigation against their students and to keep everything “in house.” This marks a turning point for many colleges and universities. Second, even if you do not have a Perkins Loan, you could still be subject to litigation. Do you owe a debt to your college or university? Do you have a parking ticket or an old library fine that you never paid? Your school has the authority to turn these debts over to a collection agency, and in many cases they do not hesitate to do so. Debts that cannot be collected through a collection agency could find their way to court, and you could find yourself being sued for a debt owed to your alma mater. While this may not be a good way to build their alumni development fund, it does ensure that their receivables stay in check. Third, while a lawsuit is a last resort for schools to collect on past-due debts, they have other means of collecting on debts. If your school is a public college or university, they may be able to garnish your wages or seize your state tax refunds. This is often a very effective way for state schools to collect on past-due debts, and they collect millions of dollars each year through state tax offset and wage garnishment programs. Finally, you should care because if a debt you owe (whether a university-receivable debt or a student loan) is past due, it will be reported to a credit bureau, and your credit rating will be negatively affected. Having a student loan in litigation will also show on your credit report, and could take years to wipe clean even if you were to win a lawsuit. Being vigilant about paying all of your debts is the best way to avoid ending up in this situation. One of the best ways to keep track of all of your federal student loans is through NSLDS.ed.gov. You can also contact your school’s bursar’s office directly to ensure that you do not owe any past-due debts, or that there are no outstanding campus-based loans that are in default. 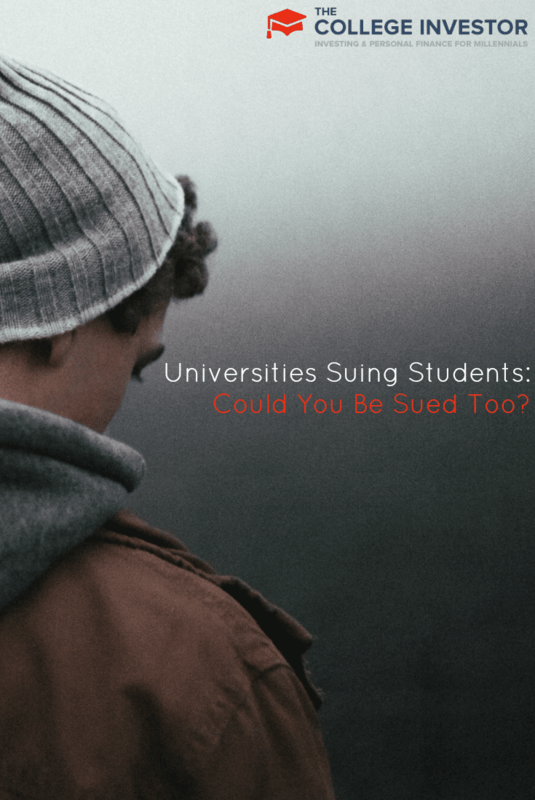 Regardless of how you feel about higher education taking their former students to courts, it is happening and you should take action now to ensure this does not happen to you! What are your thoughts on colleges and universities suing to get student loans repaid? I imagine you could get a nice class action lawsuit started for that cause. Thanks for the heads up on Federal Perkins Loan litigation. Not that it affects us. We figure we will have to pay full fare for our son. We make too much and have saved too much to get any need based loans or grants. We are hoping our son can earn some scholarships, but we shall see. He is only 12 year old now. Good point. If you did want to take out Unsubsidized Stafford Loans you still could however. You would still have to fill out a FAFSA, but those loans are not based on income at all. Sounds like you have a solid plan already though! You make a good point. I think there is a big push right now among consumers (students) to receive degrees with real world implications, and credentials that will get them hired. I think our technical schools have played a supporting role for far too long. Equipping people with real world employable skills should be a goal of education. My wife has been harassed by her school for 10 years. They collected from the gvmt but the money was never dispursed to my wife because she dropped out. But, they say she owes it. They have from the bank account, threatened to sue her, etc. She has proof she was never given this money, but nobody from the schools listens or takes time to confirm it, so the harassment continues. Not sure what kind of lawyer to get and we dont have money to pay for one.